The most senior commander of the Basque separatist movement, Eta, has been arrested in a joint Spanish-French operation, Spanish authorities say. 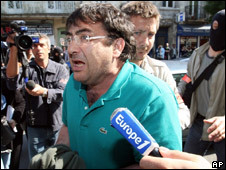 Javier Lopez Pena - alias "Thierry" - was seized with three other Eta suspects in a late-night raid in the city of Bordeaux, in south-west France. Eta is blamed for the deaths of more than 820 people in its 40-year campaign for an independent Basque nation. but formally ended it last June. Spain's Interior Minister Alfredo Perez Rubalcaba hailed the arrest. He said Mr Lopez Pena was "in all probability, the person who carried the most weight within Eta - politically and militarily". But he emphasised that the movement remained a threat. "This is a very important operation, because it involves very important leaders, so it should have a big effect. But I insist that Eta could still cause a lot of harm," he said. Eta said it carried out Monday's powerful car bomb attack in Bilbao, the economic capital of Spain's Basque region. The attack did considerable damage to buildings but did not cause any injuries. It came on the eve of a meeting between Spain's Prime Minister, Jose Luis Rodriguez Zapatero, and the premier of the Basque region, Juan Jose Ibarretxe, in which Mr Zapatero again rejected a Basque sovereignty plan. Eta has also been blamed for a bomb attack on 14 May that killed one policeman and injured four other people outside a police barracks in Legutiano, near the Basque regional capital Vitoria. The other three people arrested were named as Ainhoa Ozaeta Mendiondo, Igor Suberbiola and Jon Salaberria. Police also seized hand-guns and a computer in the raid. On the run for more than two decades, Mr Lopez Pena is believed to have assumed command of Eta in 2006, while the group was on a ceasefire. He engaged in ultimately unsuccessful talks with the Spanish government, and is believed to have been closely involved in the decision to abandon the ceasefire. 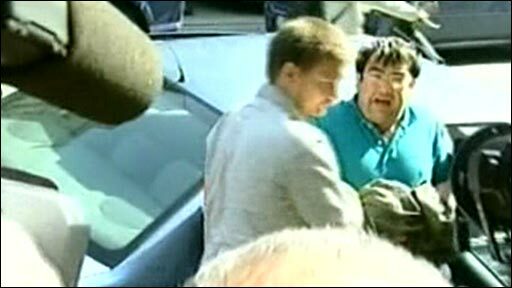 He is alleged to have ordered the December 2006 bombing of Madrid's airport - which ended the ceasefire and killed two people. Spanish media said Ms Ozaeta was the masked woman who made the official announcement ending the ceasefire in a June 2007 Eta video. Mr Salaberria is an ex-regional legislator of the banned Eta political wing Batasuna.